Home › Open Workshops › Sales Management › Management Workshop – Manchester › The People in Your Sales Team Who Really Deserve Your Time and Effort? Wouldn’t it be wonderful if every salesperson we ever hired turned out to be incredibly good value for money – while constantly displaying the effort, attitude and skill set of a truly superstar sales pro? It’s been my experience that when a sales manager or sales director takes charge of a new team they tend to inherit a bit of a mixed bag – some good, some bad, some OK – some you wouldn’t want to lose to the competition and some who cost more in wages than they bring back in profit. “Expensive” might initially sound like a bad category for anyone to be in – but when paying top dollar means receiving exceptional value – then it’s not a bad thing at all. As an example, expensive football players cost clubs big bucks because their talent can win games – and those extra games can take a middle of the table team to the top – where the rewards pay back the investment 100 times over. Champion sales people have the talent, experience and knowledge that can have similar results for any sales manager. So, how do we work with this group of superstars so that they are even better value for our business? Well, start off by including them in your plans right from the beginning, ask their advice, make sure that the way forward is endorsed by them and that they’ll rally the troops on your behalf – get them championing your strategy. You want them to become – what some marketing experts like to call – your “first-adopters“. So – get them shouting your plans from the rooftops – no point just having the team members with all the small accounts waving your flag if these superstars aren’t fanatical about where you’re taking everyone. On top of that, team them up with less experienced colleagues as mentors – give them a sense of seniority and hierarchy – and then ask them to run the odd coaching session at a team meeting to share those nuggets of wisdom that got them to the top. Make them feel valued and respected – while ensuring that they’re aware of the Return on Investment you’re expecting back from them. In sport, the cold facts are these – However good they may have been in their younger days, there always comes a time in any footballers career when offering them a $million contract would just be viewed as a bad business decision. Not necessarily so in the corporate world. 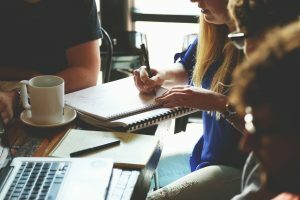 Employing superstar salespeople is rarely a bad business decision – it’s just that sometimes, Champions become complacent and need reminding that they have to deliver a wage/profit ratio in line with their colleagues – and some, occasionally, fall into the vanity trap of believing their service history has earned them the right to only deliver when they feel like delivering. When it comes to the Winners on your team, you won’t go far wrong if you’re celebrating their achievements, making them feel valued and show them that they’re an integral part of your overall plan. Sometimes this group can get a bit cocky – and might need treating in a similar way to how record companies manage brilliant young musicians. When the money’s great, the future looks bright and everyone wants to offer you something extra for a piece of your talent, it’s easy to start believing your own PR – and frequently have your head turned by lucrative counter offers. But if you can hold on to them, Winners will become your Champions of the future – but to achieve this, Winners usually need a sort of Jedi/Padawan kind of relationship with their line manager. Your guidance, experience and wisdom is vital to ensure they reach their true potential – and you are probably far more important to their career than you (or they) think you are. If you genuinely can’t offer them the development opportunities they crave you’ll probably lose them – but that’s OK – just understand that fact and be ready for it when it happens. Just make sure you look after both of your interests, by making sure you don’t let them run off with someone who is simply taking advantage of their naivety and ambition – but has no intention or less ability to help them reach the same heights as you can. I know it’s a difficult message to deliver – but an attractive $5K moving fee won’t be as useful in the long term as an annual $2K pay rise from a company that genuinely views their progress as a priority. These are the guys that appear to be well worth their money – and if you’re not careful, there’s a chance that they might also be stolen away by the competition at a snip of their worth. Some of the time you’ll be tempted to give them a pay rise just to make sure that doesn’t happen – but then there are other days when you wish the competition would just quietly come and take them off your hands – let someone else bear the burden of trying to force their true potential out of them. First of all, work out if their lack of productivity is a Capability or Culpability issue. Once you’ve worked that out you can make sure that your Coaching Regime is helping them deliver the results you need them to (follow the links for the full articles) – and nurture that potential. Make sure they understand that you’re willing to match their enthusiasm and effort in order for them to achieve their targets. So with that offer on the table, it’s up to them to step up to the plate. For all our best efforts Drains can appear in the sales teams of even the most capable managers. Just for the record, Expensive doesn’t really translate as being over-paid or deserving to be paid less, it just means that – with regards to the value delivered compared to investment – those wages can seem quite a lot of money for what the company gets in return. So, yes their wage bills and expenses can easily become a drain financially – but they can also become a drain on other vital resources too – time, effort, manpower and – worst of all – morale. 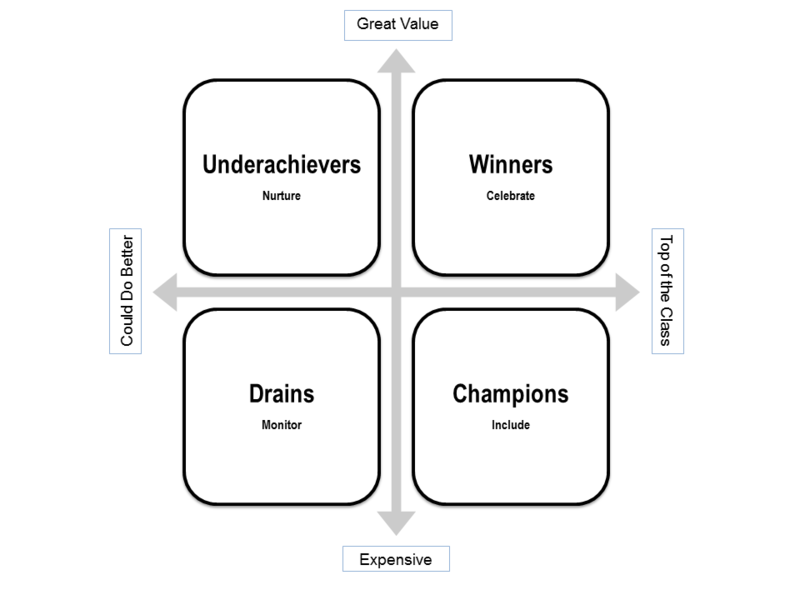 So watch out, disillusioned Champions can easily slip into this quadrant, but so can Underachievers who aren’t given the right support and Winners who get a bit too big for their boots and think they have a God given right to be paid whatever the outcome or effort – so make sure you recognise the signs. If you do end up with a Drain in the group, act quickly. Once again, work out if it’s Capability or Culpability; then make sure your Coaching Regime is delivering the results you need it to. And then as a last resort – but never leave this option so long that you’re noticing any really big issues- instigate a 60Day Action Plan that shows you whether the individual involved is willing to deliver the results that you expect and require – or (as Disney like to say regarding employees on their way out) – it’s probably time for that member of your team to find their happiness elsewhere. 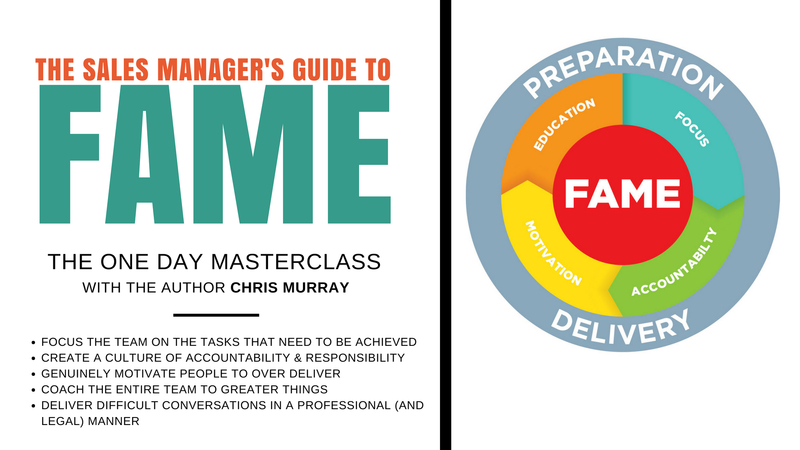 Our Sales Management Open Workshops show you how to piece together the four main elements of successfully managing a team – Focus; Accountability; Motivation; Education – and show you how to get the best out of everyone involved.